Annie Lord, MHFA Executive Director, talking to cross-sector stakeholders about the need for an affordable housing master plan at the City of Miami. The MHFA team and Anne Ray from the University of Florida strategizing on how to preserve subsidized and naturally occurring affordable housing in Miami-Dade County. Cross-sector stakeholders workshopping how to create or preserve 12,000 units by 2024 in the City of Miami. 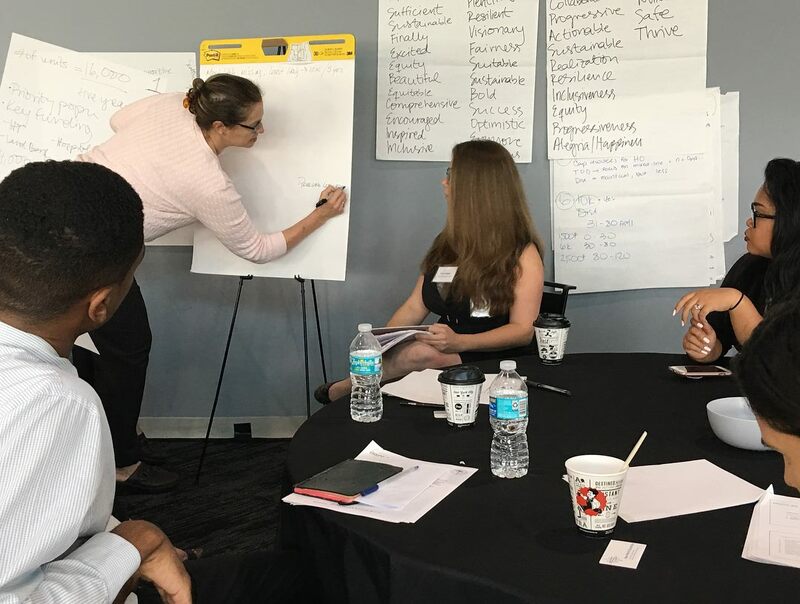 Geared toward stimulating the development of units that are affordable to extremely low and very low income households, MHFA is working with cross-sector stakeholders to create blueprints for housing affordability at the City of Miami and Miami-Dade County. This includes elected officials, government agencies, nonprofits, developers, philanthropy, banks, and residents. The idea of the blueprints is to: arrive at a shared community goal for the number of units to be created or preserved in the next five years; identify the pipeline pathways; and, identify the policies that will enable us to get to that goal. In addition, Miami Homes For All is working to create a plan that addresses the preservation of subsidized and naturally occurring affordable housing in Miami-Dade County as a pipeline to meet our community's housing needs. Through community collaboration Miami-Dade County has spearheaded an effort to create a locally designed, comprehensive system-of-care to prevent and end youth experiencing homelessness. Over 100 agencies come together to form The HOMY Collective: Helping Our Miami-Dade Youth. Miami Homes For All serves as the backbone support to HOMY, which is composed of four committees and a Youth Voice Advisory Council focusing on core outcomes for youth: Stable Housing; Well-Being; Permanent Connections; and, Education and Employment. Learn more about Miami Homes For All, Inc.